When, still in the last millennium, we decided to play Schrammelmusic, it was very clear to us that we would get deeply into our cultural heritage. There had to be something else behind the cliché of the "grumbling Heurigenmusic"! Bit by bit we managed to rediscover the warmth and the sensitivity of this specific musical genre and to bring it back to life. The secret wish to include contemporary music in our reportoire became stronger and stronger and so we rummaged through the history of the Schrammel brothers once again. Many musical examples showed us that in their compositions the Schrammel brothers used to assimilate the impressions of their travels whereby they would enrich their musical creations. This encouraged us even more to include newly composed and newly arranged pieces for these specific instruments. When we, rather accidentally, discovered that the tangos of the "Guardia Vieja" (the old school) had a similar history as the Schrammelmusic, we were quite amazed. They originated at the same time and they, too, were linked with a city (Buenos Aires). The mostly chambermusic-like instrumentation with guitar, violin, flute, and bandoneon was similarly intimate as the Schrammels’ and the musicians were attached to their traditions. Scorned for a time and almost forgotten, they were recovered by the Argentinian Astor Piazzolla, who took a new broom to them and made them world-famous as a genre in itself. 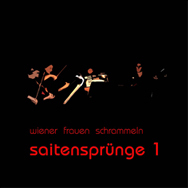 Please send us an e-mail order and let us know if you want the CD delivered by mail (bank transfer) or if you want to pick it up at one of the performances of the Wiener Frauen Schrammeln (cash payment). Please give us your postal address in your e-mail order. You will receive written confirmation with the account-number of the Wiener Frauen Schrammeln. As soon as we receive your payment, we will send you the CD. You can also pick up your order at one of our events (cash payment).